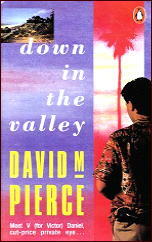 » Reviewed by Allen J. Hubin: DAVID M. PIERCE – Down in the Valley. Reviewed by Allen J. Hubin: DAVID M. PIERCE – Down in the Valley. DAVID M PIERCE – Down in the Valley. Penguin, paperback original, 1989. David M Pierce, a Canadian with a colorful background (songwriter, co-author of a musical and a cookbook, Shakespearean actor, and poet, most of this in England), arrives on our scene with Down in the Valley. This offers us V. (for Victor) Daniel, 6′ 7-1/4″, ex-con, wearer of Hawaiian shirts loud enough to wake the dead, and private investigator in the San Fernando Valley of LaLaLand. Here Daniel has a variety of cases in process, of which the most noticeable (and, apparently, most deadly) has to do with a local high school in which unlawful chemicals flourish. Pierce has the PI patter down very nicely, keeps the plot well aboil, peoples it colorfully (to say the least), and entertained me exceedingly well. I could do with more of these, and in fact two more Daniel capers are in print, shortly to be sampled by me. Vol. 12, No. 4, Fall 1990. Write Me a Letter. Scribner, UK, 1992. Mysterious Press, 1993. If you like the zaniness of the Shell Scott novels, then you should like the Vic Daniel books, too. I don’t know why the latter never caught on, though. Maybe by the time the 1990s rolled around, zaniness was out. I live in the San Fernando Valley — have for twenty-two years now — so ordered DOWN IN THE VALLEY as soon as I read this review. Hope you’ll report back when you have this one under your belt! Rick, I miss the Valley. In 1989 I lived in Encino. People don’t realize the size of the Valley or the variety of the people and places inside it. I am surprised more writers have not taken advantage of the setting. My mother and I love all of the Victor Daniel books, and it’s driving us crazy that the author seems to have disappeared (in Paris). We figure he’s having a good time living off his royalties, but would love to find out what he’s been up to and if he’s still writing. Nosy, I know, but that’s what happens when you write good books. You get fans who want to know. Al Hubin’s review has told me more about the author than I’d ever known before. He seems to have been a talented fellow. I tried Googling him to see if I could find out more, but even with the “M,” David Pierce as a name is too common to do me any good. I also wonder why the “M” is underlined, or even what it might be short for. “Big Dave” Pierce is still living in Paris and might even post a comment here, but as his agent, I’d like to add a few things. 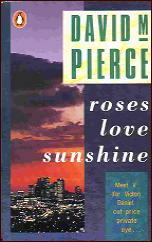 I was lucky enough to discover David M. Pierce in 1989 in Paris and have the chance to read the first Vic Daniel mysteries. An agent is often asked to read unpublished books, and usually they are disappointing, but I was hooked the minute I read DOWN IN THE VALLEY and signed David up immediately. With the help of a British agent, we sold the first three books to Penguin for the UK and USA, and then I sold them in France, Germany and Denmark. Unfortunately, the books seem to have been jinxed from the start, as several of his editors moved to other houses before the books came out, which is disastrous for an author! David has been in ill health for the past several years, which is why he has not been able to write more, but I’m sure he will be very pleased to see all your lovely comments. Thanks for finding this review and leaving a comment, Lora. 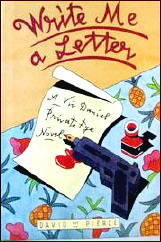 The three books David did for Penguin were rather a departure from their usual line of mystery fiction, being paperback originals for one, and not reprints of well known authors. They were hard to find at the time, even if someone like myself was looking. I’ve always assumed they were promoted badly; a change of editors will always do that! Yes, please make sure David sees this post and the followup comments. The “M” in David M. Pierce stands for Milton, that is John Milton, who was one of Dave’s mother’s favourite poets. Thanks for the info! I’ve already passed it along to Al Hubin for his Bibliography of Crime Fiction. I was sitting at my computer working and for some reason the phrase “willing boy” came into my head. After a few minutes of thought it finally came to me that it was a character in David’s books. I too have been disappointed that the series came to an abrupt halt – I love the books; Vic, Sara and WB are all excellent characters and I often turn to a Vic Daniels novel when I need a bit of a lift as they are brilliantly funny. I’m really sorry to hear that David is unwell and unable to write – that must be very difficult for him. 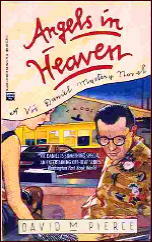 It would be great to get all the Vic Daniel books republished as ebooks. Big Dave was the son of the Canadian Ambassador to France ( how he began is love of Paris). His ‘zannyness’ is best illustrated by those Pamplona Running of the bulls years. This Very tall man running in front of the toros wearing huge clown feet. The great photos of Dave and the ‘1,000 & 1 club;’ when after the encierro Big Dave would throw this newspaper on the ground in the middle of the bull ring, put a foot solidly on its center, then dare the Fighting Vacas and their horns to try & best him! Dave writes like he lives- very colorful and with Gusto. Remind Pierce that ‘writing Is therapy.’ The world still needs his tales and smiles, thanks. I wonder if this writer could be my cousin, David Pierce?? I’m Canadian and in my teens I was very close to my cousin whose name was David Pierce, who went to high school in Toronto where I lived. One of our cousins in California recently told me he became a writer and is living in France. I’m in my early 80’s and he was close to my age. When he was in his 20’s his father became Ambassador to England. David visited me when I was living in Majorca, Spain, in the late 1950’s or early 1960’s. I would love to hear more, if anyone knows. Thank you so much! I am trying to locate an email address where I can contact David M. Pierce, former husband of Bonnie, my friend from England now living in Sacramento, CA. Does anyone have this information? Thanks. We’re very glad to have been able to get David’s books back out there again! Good news! I’ve just ordered paperback editions of the last two Vic Daniel books. I’ve been looking for them without much success for quite a while. I’m back again, years later, still hoping for news of David M. Pierce, and lo and behold, there is some! Although I’m sorry to hear that he’s been in ill health and that his books were jinxed. The same thing (the jinxing) happened with another excellent writer, Barry Hughart, who wrote about a “China that never was.” Fantasy rather than mystery, but excellent, in case anyone is looking for another good writer. He only published three books, alas. Meanwhile my mother, at her great age of 90, is enjoying reading on Kindle, so I am delighted to hear that his books are available there now. (Me, I still read on paper.) Thank you, everybody, for all the news. Very pleased to have found this page.I was thinking about him randomly the other day and now trying to find copies of his books.Sorry to see the last post about his ill health. I had the wonderful opportunity to spend time with David in Paris in 97-98. Quite a colorful character and wonderful person. I fondly remember reading the wild tales of Vic Daniel. These are some of my favorite books – great to read at bedtime. I’m pleased I’m not alone in enjoying them.